On February 2nd, head down to the beach (no, not for a chilly ocean dip) to explore some family-friendly attractions at Vanier Park as part of the annual Winter Wander. It’s only $5 per person and FREE for kids under 5 to visit the Museum of Vancouver (MOV), HR MacMillan Space Centre, Vancouver Maritime Museum, the City of Vancouver Archives, the Vancouver Academy of Music and Bard on the Beach, who open their doors so families can experience history, science, music, and performance art at a bargain price. The Planetarium Star Theatre is a big draw at the Space Centre, with shows about dark matter and the seven wonders of the universe. Highlights include one of the only five touchable moon rocks in the world, the Mars Rover Lego table, The Alien Game where kids Morph into an alien from one of three different alien worlds. And for fun, the kids can snap a picture on the lunar landscape in a space suit! Check out the super cool, Wild Things: The Power of Nature in Our Lives exhibition, which delves into the life stories of local animals and plants—how they relate to each other and how they connect people to nature in the city. Includes hands-on activities, encourages visitors to examine their relationship with nature, think about momentarily disconnecting from their devices, and find equilibrium with the natural world around them. This is a fun one. There is a ship inside the building! Check out the St Roch, the first ship to sail all the way around the continent of North America. There are absolutely loads of intricate model ships to peer at, and a life-size model deck to jump around on. How much do we love the Vancouver Maritime Museum? VAM will be showcasing choir and quartet performances throughout the park, as well as have their doors open so you can watch the musicians in action. The Archives are full of treasures about our city history. 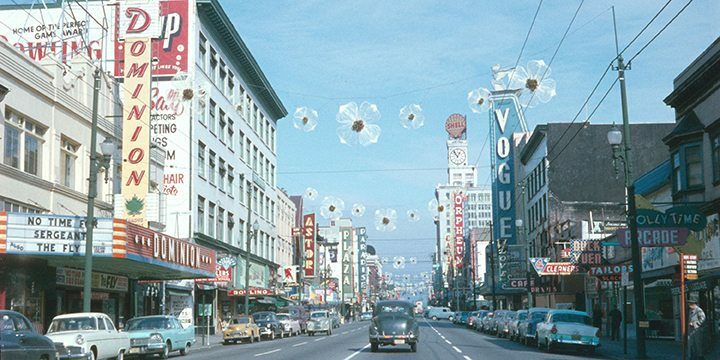 Check out photos from the Merging Time project, created by Langara Photo Imaging students, that combines archive photos with pictures of the current site. Take a photo of you and your family with an actual old Polaroid camera, or try for old time version of the family portrait with a view camera. Not to be missed, are performances by Bard’s Riotous Youth and the Vancouver Academy of Music students, traditional indigenous storytelling, intriguing exhibits, a day in space and a rocket lab, and exposure to Vancouver archives. Plus local food and coffee vendors, a family fun photo booth and a chance to win prizes! Cost: $5.00/person, children five and under free. Admission can be purchased on event day at Museum of Vancouver, H.R. MacMillan Space Centre, or the Vancouver Maritime Museum. More than a tourist attraction, the H.R. MacMillan Space Centre is a non-profit community resource that provides a unique learning experience for all. Visitors can learn about space and the night sky through planetarium star theatre shows, live demonstrations, and an interactive exhibit gallery. Next to the Space Centre is the Gordon MacMillan Southam Observatory.